We were really curious to see how our 2017 taxes were going to turn out. Our tax situation was different than it had ever been so we weren’t quite sure what to expect. Last year we bought a house (after not having owned one for five years), ran two profitable businesses (my blog and my husband’s law firm), rented our above-garage apartment (as first-time landlords), and added another kiddo to the four that were already at home. Another happy change is that we faithfully put aside money each month from my blog earnings and paid our safe harbor estimated quarterly taxes. Between my husband’s withholdings at work, the estimated quarterlies that we paid, and our tax deductions, we actually ended up with a refund for 2017. That’s a big difference from where we were the year before! Our tax advisor also said that if our 2018 income, expenses, and deductions were the same as in 2017, our 2018 federal taxes would be about $5,000 less under the new tax laws! Some things will be different with 2018 taxes, as we’ll have much smaller expenses related to the rental. It’s hard to say, with our businesses, what our income will be by the end of the year. We weren’t sure which way it was going to go with taxes in 2017, whether we would have to pay or get a return, but we were happy with how it worked out. Okay, onto the numbers from April 2018! Our total income for April was $10,789. Since we live on last month’s income, this is money that we’re waiting to spend in May. Attorney Income (Day Job)– $6,309 Mr. SixFiguresUnder has been working full-time as an attorney for the state of California since the fall of 2015. His actual take-home pay was $5,197 but I add back in the cost of the benefits (insurance, dental, vision, parking, union dues and retirement) that are automatically taken out of his check so that we can tithe on that money. Attorney Income (Private Practice)– $2,105 On top of working full-time, my husband has a part-time private law practice on the side. He started it to help speed up our debt payoff and because he had clients from his days at a small firm that didn’t want to let him go. This income fluctuates greatly from month to month. My Income (Blog)– $2,375 The income that I report is the income that I received this month minus all of my blogging expenses. Of this, I’m setting aside 25% for taxes ($594) and distributing $1,781 to the family checking account as my paycheck. Last year I set aside 30% of my blog earnings and it more than covered our tax liability for both of our businesses. I get a lot of questions about what sort of training I had that helped me learn how to earn money blogging. While technically there’s no training required to blog, it’s definitely easier when you’ve got someone showing you step-by-step how to do it successfully. I went through Elite Blog Academy back in 2014, which really helped set me up for success. Our spending in April came from the income we earned in March Here’s how we spent money in April. Tithing– $949— We happily pay a 10% tithe on our total income from the previous month. You can read more about why we paid tithing, even when we were in debt. Other Giving– $80– Other charitable giving this month. Mortgage– $3,200 We recently refinanced our mortgage from a 30-year to a 15-year mortgage. If you want to see all the numbers and read about why we did it, read this post that my husband just wrote explaining everything! Because we were in the middle of the refi process, we didn’t have a mortgage payment due on April 1st. We would normally have paid that in March, to be another month ahead on the mortgage, but instead we kept that money in our mortgage category so we could be an extra month ahead on the new mortgage instead. We had some expenses with the refi in the past couple of months, but we also got some money back from escrow overage from our original mortgage. It’s kind of tricky to explain, but I’ll show you in the video above. Essentially we only put $652 of April’s budget funds toward our mortgage in April. If you want to know more about our house finances, you can read more about why we got a conventional mortgage instead of FHA or USDA and then why we didn’t wait for a 20% down payment. Electricity– $212 Our electric bill is for two households, as our renters are on the same meter. We very rarely use our heater (and our rental uses propane for heat), so this is mostly from the water heater, lights, washer/dryer, fridges, etc. Water– $46 Our water bill comes every other month, so I just set aside approximately half of what I expect the bill to be. Internet– $50 This is one bill that I am especially grateful to have. Last year at this time we still didn’t have internet at home and that was tough! Home Phone- $4 Since my husband works at home a day or two each week, we decided to get a home phone for him to use. It’s Ooma, which is internet-based, not a traditional land line. The monthly service charge is minimal ($4) and the set-up (hardware, etc) was under $100. If you think Ooma might work for you, that link will also get you a $20 Amazon gift card! Republic Wireless Cell Phones– $17 We’ve been using Republic Wireless as our cell phone carrier for over three years now. This covers the cost of service for my phone, including all taxes and fees. (We’re on the Republic Refund plan from a few years ago which is no longer available; an equivalent plan for a new user today would be $20/month). My husband also has a Republic phone which he uses for his private practice, but that’s a business expense, not a family budget expense. If your cell phone bill is killing you, I definitely recommend that you check out Republic Wireless! Health Insurance– $316 We have insurance through my husband’s employer. This is the portion of the insurance premium that his employer does not cover. The total coverage includes health, dental and vision insurance premiums. This $316 is deducted directly from his paycheck and goes straight to the insurance company, so it never makes it to our hands. Car Insurance– $168 Our auto insurance at USAA is fabulous! In addition to the wonderful coverage, they also give us dividends at the end of the year, which is always a nice treat. We’re able to get insurance with USAA because my father-in-law was in the service years ago. If you, your parent, or your spouse were in the military, you’re probably eligible for USAA too! Food– $401 This year I’m sharing exactly where our food budget goes. At the beginning of April I shared our monthly grocery shopping trip that was $250. Later in the month, we spent another $30 at Sam’s Club for 4 gallons of milk, 6 bunches of bananas, baking potatoes, and ice cream. We spent about $20 for hot dogs, s’more stuff, and square bread for pie iron pizzas. We spent $30 at Grocery Outlet for some granola bars and a few boxes of cereal. Also included in April’s grocery budget is the $45 renewal fee for our Sam’s Club membership. I knew that was coming up from the beginning of the month, so in my mind I just told myself we had a $350 grocery budget in April. Gas– $402 Gas around here is at $3.35/gallon. My husband commutes an hour each way 3-4 days a week, so that’s where a lot of our gas budget goes. Parking– $165 Working downtown means paying for parking. It comes straight out of my husband’s paycheck, which means it is paid for with pre-tax dollars, a small consolation. Clothing– $73 I found a brand new Jos A Bank suit on Ebay for my husband. He wears an uncommon size (44 XL), so I get excited when I find one for a great deal. Last time we were in the Jos A Bank store they had a total of 4 suits in his size. I also got a few things for the kids and a shirt for me using some credit I had with ThredUp. Household– $83 I was pretty excited that we spend under $100 on household expenses! Fun– $6 We got a couple of Redbox movies. Animals– $95 We bought eight 50 lb bags of chicken feed because they were on sale for $11. We also found an animal carrier at the thrift store for $7. Tax Prep– $90 Our tax advice and preparation plan allows the cost to be spread over the year. Some people wonder why we pay so much for this (a total of $1080 a year), and that’s a valid question. We prepared our own returns for years, but in the last few years, as our income sources have been varied, we’ve found the planning and preparation more than pays for itself in minimized tax payments (actual dollars), not to mention to the additional peace of mind. Allowances– $60 We recently started giving allowances for our kids. I’ll explain our system and how it’s working in an upcoming post, but if you want a sneak peek, check out the book The Opposite of Spoiled. Kids Activities– $39 We bought some fabric and costume pieces for a musical production that we were in. Now that we’re done funneling every extra cent toward debt, we use sinking funds in our budgeting. This is money that we set aside each month into certain categories where it builds up until we need it. The amount in bold is the amount that was added to the fund. Any spending from the fund is noted in the comments, along with the current category balance. Home Projects– $0 We didn’t add anything to our home project fund, but we did spend $16 to buy some garden soil. We still have $994 left. Dental– $30 We have $120 in dental right now. Medical– $100 We had a busy medical month. We had three $15 copays and a prescription in April, totaling $55 Our current balance for medical is $401. Car Repair– $300 We spent $56 in March for an oil change and new air filter for the van. The current balance in our car repair fund is $844. Car Registration & Smog– $40 We currently have $104 in this fund. Christmas– $100 We currently have $400 in our Christmas fund. Gifts– $40 We didn’t buy any gifts in April. Our current balance is $123. Vacation/Family Reunion– $200 We have a couple of road trips and a family reunion planned for 2018, so we’re designating some dollars to those expenses. We have $309 in this category. The total we want to save in 2018 is $26,000 ($15,000 toward our emergency fund and $11,000 to my IRA). At the end of April we are at $10,841, which is 42% of our goal! Our goal for 2018 is to reach $25,000 in our emergency fund (we started out with abour $10,000 at the beginning of the year). In April we put $3,413 (and got a bit of interest too) toward our emergency fund, which makes the current total $14,588. In April we contributed $550 to my IRA. We decided to automate this contribution each month so that by the end of 2018 my IRA will be maxed out. Lots of you have been curious about why we don’t include any rental income in our budget report. In short, we are still paying ourselves back for the repairs and improvements we made to the place when we first rented it. Considering the cash we put in in the beginning, we haven’t turned a profit yet, though we are happy that the rent is paying for the work we put into it. For a detailed explanation, check out the bottom section of last month’s budget update. There you have it! Personal finance made public! 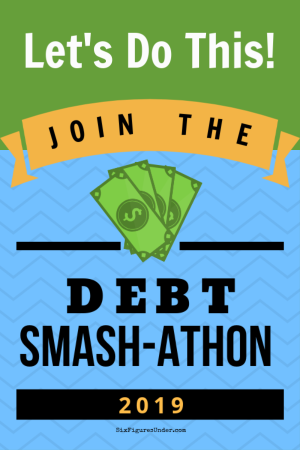 I’d love to hear about how your budget and/or debt repayment went in April! I’ve been a blog follower for years but haven’t read allll the posts, so I’m not sure if you’ve addressed this before, but with your sinking funds, have you set up an individual account through your bank for each one? Or do they all go in one and you just keep track? Good question Torrie! Besides the emergency fund, everything else is just in our checking account. Since we track everything and always spend according to our budget in YNAB, we aren’t worried about accidentally spending our sinking funds on something else. We’ve been doing this for four years now and it works perfectly for us! I started with sinking funds about 20 years ago. They are such a lifesaver. There is no sweat or worry on the months that the car insurance is due or the property tax. I have accounted and saved for it all. I include everything that I know will come up during the year, including small things like Amazon Prime. Two of my children use them also. Thank you for your transparency. Money shouldn’t be such a touchy subject. My husband works for the county so anyone can see what we make if they wanted to anyway. I totally agree Marty! It is so nice to not have to scramble for those expenses that come up periodically! My husband’s suit size isn’t standard either. He gets his suits tailor-made from tailors in Pakistan or Thailand for about US$100. You can do it via eBay if you don’t feel like taking a family vacation to Thailand (but you should – Thailand’s a great place for family holidays, just avoid the girly bars.) You get to choose from about 50 different fabrics (and they’re a good quality wool), you get to choose from a myriad of different options (seriously, they cater for everything, cuffed legs, uncuffed legs, different types of collars, different types of pockets, if you want a pocket for an iPad they’ll include one, etc. ), you pay the money, send over your measurements, and in a few weeks you get a hand-made suit delivered to your door. It’s a fantastic option for men who can’t buy off the rack. I’m always impressed by your grocery budget. I can’t get mine down that low, and we’re only a family of four. But our electricity bill is much lower. Our energy costs are some of the highest in the world, but we manage to keep our bill around US$40 – $45/month. The savings there doesn’t make up for our higher grocery bill though . . . .
We’re still redoing our kitchen (yep, we’re slow – we’ve had to get some things custom-made to fit the space, which always costs more and takes longer) and I’m in the process of buying a new-to-me car to replace my 15 year old car, which has about 225,000 miles on it and is literally held together with duct tape (thanks to a tow truck driver who decided to side-swipe me and take off my front bumper) so it’s a very necessary expense; but I’m sort of feeling swamped by expenses at the moment. But by June we should be through the worst of it and starting to come out the other side. It’s nothing we can’t handle; but for instance hinges for the kitchen cabinets are costing US$750 – for freaking hinges!!!! And they aren’t even the push-to-open kind, they’re just the cheapest hinges we could get for this kitchen – and it’s like a kick in the gut to have to spend that sort of money on something so boring. That’s a trip to Sydney for the entire family. Hey Becca! I would like to take a trip to Thailand and get my husband some custom suits. I gues we could order online, but it sounds like a good excuse for a vacation to me! But realistically we should probably just order from home so he’s not retired before we make it over there! How do you manage to get such a low energy bill! What’s your secret?! We have a 1 kw solar power system, which helps keep our bills low; but we’re also very careful with using energy. Our monthly energy usage is less than the energy company expects for 1 person living in a studio apartment. We don’t feel like we’re missing out on anything; we’re just careful. The kitchen is a big, expensive project. We knew it would be. If we’d moved into a house with a normal outdated kitchen, we could’ve just painted the cabinets, updated the benchtop and flooring, and called it good for about $1000. But our kitchen was a hodge podge of broken, mismatched cabinets. Each and every cabinet unit was different. We couldn’t even get by with just changing the doors, because some of the doors had hinges on the outside and some had hinges on the inside and all of them were different sizes too. The space was also not utilised very well – there was only one wall cabinet, there was a broken-down 30 year old plywood bookshelf in the pantry that looked like it could topple over at any moment (and also didn’t match anything else in the kitchen), there was no place for the dishwasher, there were huge spaces where the floor cabinets were missing. And none of the cabinets were actually mouse-proof, which, living rurally on several acres of land, is kind of a big deal. We really had no alternative but to gut it and start from scratch. We’re trying to keep costs as low as possible; but we also understand that having a nice, functional kitchen will add quite a bit to the resale value of the house. We only plan to do this once . . . so we might as well do it properly. On a budget, still (we’re looking at about US$7500 all-up for the kitchen, which is really quite reasonable for a kitchen as large as ours) but properly, with cabinets that match and a kitchen that looks stylish and fresh instead of, well, like a hodge-podge of units pulled out of various homes and plonked down on lino laid crookedly in a room which, originally, had a window between the kitchen and bathroom, because nothing says “good morning” like making breakfast and seeing your loved ones in all their morning glory as they step out of the shower! I’m curious – how long is eight 50# bags of chicken feed going to feed your birds? A year? That’s a good question, but it’s definitely not a year! We have 12 chickens and 3 ducks. I’m guessing 3-4 months. Right now they are eating less than normal because they are free ranging a lot during the day. I recently found your blog. I really would like to read more later when I have more time. We have some similarities. We also tithe on gross income and I use Republic Wireless, for example. You mentioned giving your children allowances. My parents gave me a small allowance when I was a teenager in the 1980’s but I was required to buy all my personal things, including clothing. I believe it really, really helped to learn to manage money good.